"This guy is the ultimate insider. He's got something to say, he wants to say it, I want it on 60 Minutes." Looking strictly at plot, The Insider is a big departure from writer/director Michael Mann's last effort, Heat. 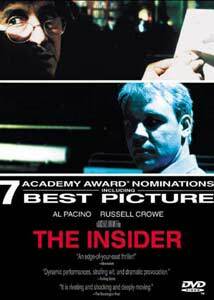 The Insider is not a cops and robbers drama. It doesn't contain any car chases or fantastic shootout sequences. However, like Heat, the characters, and the process of fleshing them out, takes precedence over the action. Regarded by many (myself included) as one of the ten best films of 1999, The Insider is a powerful docudrama about the catalyst that led to the eventual legal downfall of Big Tobacco. In the opening scenes, we are introduced to The Insider's two primary characters. First we meet Lowell Bergman, a producer with TV's 60 Minutes, blindfolded and in the back of a car speeding through the streets of a city in the Mid East. He is on his way to arrange an interview for correspondent Mike Wallace with Sheikh Fadlallah. Next we meet Jeffrey Wigand. Wigand is a former VP with Brown and Williamson Tobacco whose employment has just been terminated. We meet him as he packs up his desk and leaves his office for the last time. He must go home to his lovely suburban home and explain to his wife and two young daughters what has happened. Bergman and Wigand soon meet when Bergman hires Wigand as a consultant to translate some Philip Morris reports he has received from an anonymous source. It takes Bergman very little time to realize that what Wigand knows could be far more newsworthy than just his ability to translate some tobacco company burn rate reports. The Insider is a play with two main acts. In the first, Bergman gets to know Wigand and slowly convinces him that he should tell what he knows, namely that the CEOs of our nation's largest tobacco companies were lying through their collective teeth during recent testimony before Congress about the addictive nature of nicotine. Wigand, even once convinced, is not simply free to just spill his guts on national television. He has signed a rigid confidentiality agreement with B&W and the repercussions of breaking this agreement would be too great for him and his family to withstand. Lo and behold, Bergman discovers a loophole. If Wigand is subpoenaed by the State of Mississippi to testify in their trial against the tobacco companies, he is legally required to testify about what he knows. Once his testimony becomes part of the public record, he can freely discuss it wherever he likes and his confidentiality agreement with B&W no longer applies. Risking both his already fragile marriage and a possible jail term for contempt of court in his home state of Kentucky, he does so. The second act of The Insider concerns itself with the struggle that ensues to get the 60 Minutes interview with Wigand aired. Once the CBS legal department catches wind of what is going on, they ask that the interview be shelved because to air it would make the network vulnerable to a tortious interference lawsuit from Brown and Williamson. Through some investigating, Bergman discovers that the real reason to shelf the interview might actually be an attempt to avoid damaging the upcoming CBS merger with Westinghouse, a merger that would prove to be a financial windfall for several of the same CBS executives that want to shelf the interview. The rest of the film follows Bergman's often clandestine efforts to force CBS to eventually air the interview that would eventually lead to public outcry and billions of dollars in tobacco industry settlements to all fifty states. The Insider was inspired by a Marie Brenner Vanity Fair article entitled "The Man Who Knew Too Much." Like virtually every Hollywood docudrama ever made, The Insider does take some liberties with the facts. Lowell Bergman's secret efforts to convince The Wall Street Journal to run an article about CBS's reluctance to air the Wigand segment are fabricated, most of the terrorist type threats made against Wigand are unsubstantiated and based entirely on assertions made by Wigand, 60 Minutes executive producer Don Hewitt is probably painted as more of a villain than he really was, and so on. However, in its broad strokes, The Insider is dead on in its representation of recent history. Compared to other recent Hollywood docudramas, such as 1999's The Hurricane, The Insider seems almost saintly in comparison with its occasional misrepresentations of fact. The Insider is genuinely powerful stuff. Mann has proven his deft touch behind the camera with his previous films and he shows it again here. The pacing and presentation of this film are nothing less than first-rate. Featuring a stellar supporting cast, performances are exceptional throughout. Pacino is his typically solid self as Lowell Bergman, man whose passion for journalism cannot be doubted. Russell Crowe, the Australian hunk who has recently made a name for himself in such films as L.A. Confidential and Gladiator, undergoes an amazing physical transformation to play Jeffrey Wigand. Crowe's Wigand is nervous, somewhat timid, yet prone to occasional passionate outbursts. Diane Venora who, like Pacino, appeared in Heat, also undergoes somewhat of a physical transformation for her role as Liane Wigand, a woman tormented and eventually overwhelmed with the tribulations of her husband and the bitter effect they have on her previously serene existence. Mike Wallace is adeptly portrayed by Christopher Plummer, and he has one of the best scenes in the film. Bruce McGill is wonderful in his small role as Ron Motley, one of the Mississippi state's attorneys. Finally, in an interesting casting move, Mississippi Attorney General Michael Moore is played by...Mississippi Attorney General Michael Moore. Moore has only a small amount of dialogue and screen time but he carries the work off convincingly. The most common criticism of Michael Mann's Heat was that it was overly long and contained too many distracting subplots. The identical criticism could be made against The Insider. While I can understand, in both cases, what spawns this criticism, I believe it is leveled by those that, for whatever reason, could not or would not immerse themselves in the films. I was riveted from the word "go" and found the additional girth to enhance, rather than detract, from both films. The Insider was nominated for seven 1999 Academy Awards® including Best Picture, Best Director, Best Actor (Crowe), and Best Adapted Screenplay. Image Transfer Review: The image quality of The Insider is pristine. Black levels are excellent, I saw no evidence at all of pixelation or artifacts. Much of this film involves darkened interior shots but the picture remains vivid and crisp throughout. Picture detail is simply first rate and the colors are pleasing and rich with no sign of bleeding to be found. This really is a first-rate anamorphic transfer. Audio Transfer Review: While The Insider is predominantly a dialogue driven film, the 5.1 audio transfer still impresses when it needs to. Great atmospheric use of the surrounds is used in many of the outside shots and the haunting score exudes from the front sound stage. Dialogue is crisp and clear throughout, even when there is ample background noise present in the shot. There is not much to drive your subwoofer here but some good LFE does appear in places. Extras Review: The only major flaw of this otherwise terrific DVD release is that it is rather light on extras. A short featurette is included and it follows the standard format. Interviews with the film's stars are intermixed with some production footage and film clips. The real gems within this featurette are that short interview segments with some of the real-life participants such as Lowell Bergman and Jeffrey Wigand. If only the featurette were longer. One rather unique extra, entitled "Inside a Scene," is also included. Using the scene wherein Bergman and Wigand first meet in person, we can read the original script as well as Michael Mann's scene notes and then compare them both with the final result. This is a terrific idea and I wish there had been more of it. Like other recent Disney DVD releases, film trailers play automatically once the disc is loaded into the player. These can be skipped with your chapter forward button and re-accessed via the menu for later viewing if desired. That is pretty much it for extras, unfortunately. A commentary track featuring the real life Wigand and Bergman, along with Michael Mann, would have been a tremendous extra to include. Alas, we can only dream. While a little light on extras, this is a high-quality release of an exquisite film and a DVD I highly recommend to all fans of taut, well-written drama.